I am reluctantly selling my Ogre Kingdoms Warhammer Fantasy army to feed my Warmachine addiction. 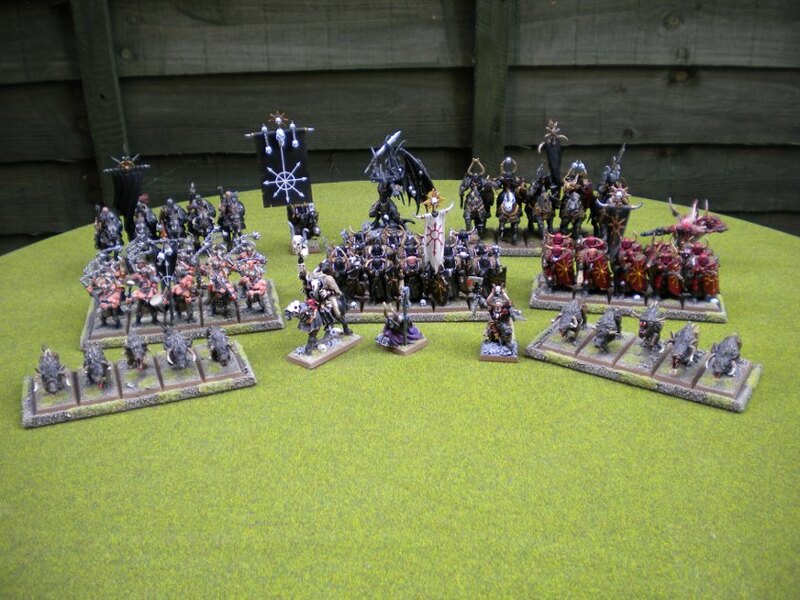 I have not played a game with this army for over eighteen months. I can’t see me getting the urge to play Warhammer Fantasy in the future. Click here to see individual pictures of the army. I will be purchasing this bad boy from Maelstrom Games in the near future. This miniature will be my new Bruiser Battle Standard bearer for my Ogre Kingdoms army. In the new 8th edition rules for Warhammer Fantasy the Battle Standard Bearer in my mind become a must include in any army. It may need a little conversion to include the army standard, but thats not a problem. 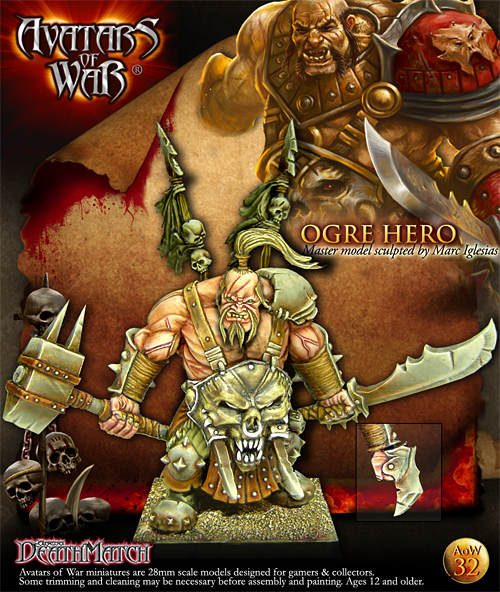 The miniature is made by Avatars of War who specialize is making Lord/Hero characters for fantasy armies. At £19.75 (thats 10% off for shopping at Maelstrom) its a bargin! The next tournament to be held at Maelstrom Games is Winter Incursion in December. This is a 2,400 point tournament, six game, two day tournament. I wanted to put together an Ogre Kingdoms army list and concentrate on playing the same list. I am planning on playing once a week so that I know how to play with the list. I want to be going into this tournament with the most practise and most familiarity with a list than ever before. My initial thoughts was to go for a brace of Hunters. I have only played with a brace of Hunters in tournaments twice before, at Winter War and Summer Incursion. In both tournaments I finished in last place, so this time around I want to improve with a brace of Hunters list. But with the mandatory 8th edition Bruiser BSB in the list, this left only 20 point of magic items to spend between the two Hunters. And Hunters need some magic items to keep them alive and more effective. So the brace of Hunters list was destined for the waste bin from the start. I know I like to play with miniatures that are more appealing to me, but a brace of Hunters is really no longer an option. I started with the core options and went for two units of five Ironguts both with Bellower and Standard Bearer. Followed by the mandatory unit of five Bulls again with Bellower, Standard Bearer and additional hand weapons. This give me a slot in each of these units for characters, making three units of six Ogres. Next two units of twenty Gnoblars Fighters and a unit of ten Gnoblar Trappers. Since I started playing with Gnoblars Fighters, I have found these to be invaluable. The Gnoblar Trappers were also a must in the list, with the early game potential to deal with war machines. But now I had more Gnoblar Fighters than Bulls and thats an illegal army build, so put in a small unit of three Bulls with Bellower and additional hand weapons. So that amounted to 1,032 points and 43% of the army. 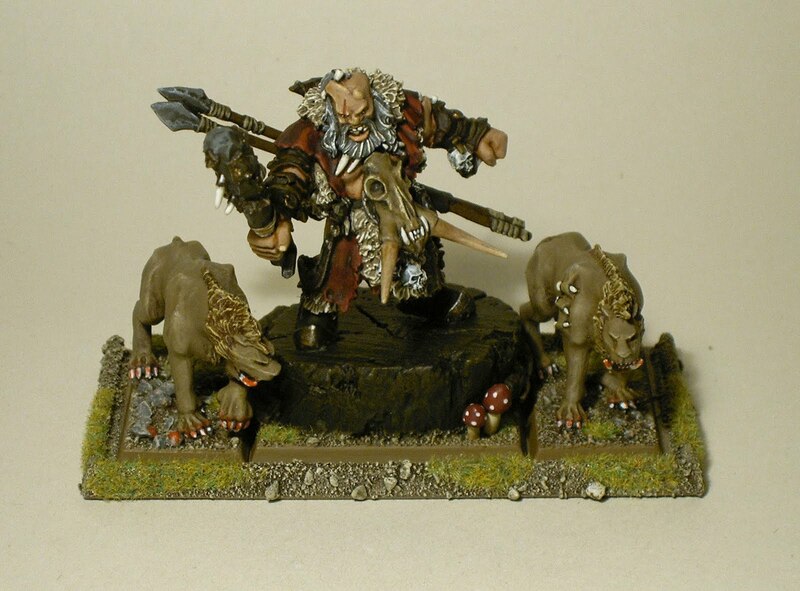 Next I looked at the Lord options, with 600 points to spend I opted for a Tyrant and a Slaughtermaster. The Slaughtermaster I see has a auto include in an Ogre KIngdoms army in 8th edition, with +4 to dispel it is a no brainer in my mind. Having thought long and hard over the Tyrant I gave him the Tenderiser and Armour of Destiny along with a Luck Gnoblar. The Slaughtermaster has the Talismam of Preservation, Bangstick and a Luck Gnoblar. I couldn’t afford to put a magic weapon on the Slaughtermaster, I was too stretched for points. Next Hero’s and again 600 points to spend I opted for the 8th edition mandatory Bruiser Battle Standard Bearer. With re-rolls for all Leadership based test this really is another no brainer in my mind. Now I had a decision to make! Do I opt for a Hunter kited out with magic items or two units of two Leadbelchers. I opted for the Hunter, purely based upon the decision that I like the miniature and playing the game for me is more about what I like to see on the battlefield than what are the better units in the game. The Brusier is kited out with the Sword of Might and the Wrydstone Necklace. The Hunter has Armour of Fortune and Beastkiler. Now Special and Rare options. In the Special options I choose a Scraplauncher, since I purchased this miniature earlier in the year I have loved playing it in the army, so for me this is an auto include in the army list. It may only be strength three, but with killing blow it has the potential to make a mess of large infantry units. I would like to see two Scraplaunchers in the list, but at the moment I can’t see me purchasing, building and painting another one. The last time is was a nightmare! So with all of the above in the army I had 184 points remaining to spend, again more decisions. I looked at the miniatures I had remaining and gave my self three options. A Maneater and a Gorger, a unit of three Leadbelchers or two Maneaters. I opted for two Maneaters both with heavy armour, one with a great weapon and the other a Cathayan Longsword. I am still not sure over this decision, so this may change over the comings weeks. I like the potential with the Maneaters supporting and providing flank charges. So I have the army build and fourteen weeks to practise with the list before the Winter Incursion in December. The Sutton Immortals will hopefully be hosting Immortal War again this year, this is a tournament I enjoyed last year and would like to attend again. 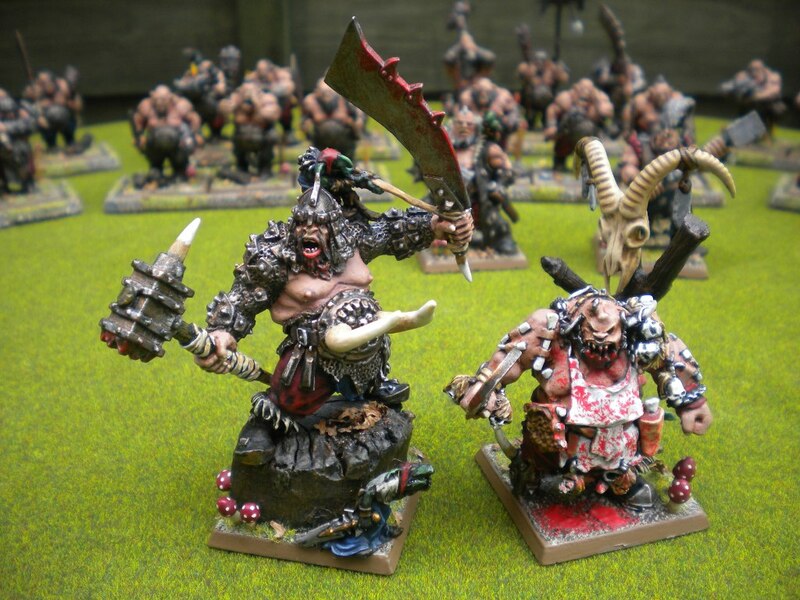 So will be taking along my Ogre Kingdoms for some tournament practise prior to the Winter Incursion. For the very first time I have a Ogre Kingdoms army without Leadbelchers, will this be a mistake? Should I drop the Hunter and include two units of two Leadbelchers, they do tend to blow them selfs up alot!? Over the comings months we will see how the Hunter on the battlefield fares, but I just love the miniature! Now all I need are some bigger movement trays and a Bruiser miniature for my Battle Standard Bearer. I had my first Warhammer Fantasy 8th edition game last night at Maelstrom Games. I played with my Ogre Kingdoms army against James’s Dark Elves at 2,250 points. I haven’t yet got my hands on the new 8th edition rule book (will probably wait for the soft back version in the new box set now) so I muddled through. Therefore my Lords and Heros were not armed with any of the new magic items. James’s Dark Elves was very much like a standard 7th edition build, three units of Dark Riders, two units of ten Archers, a unit of twenty Black Guard, a unit of ten Shades, a unit of six Cold One Knights and two Hydras. End result was all of my Ogres removed from the battlefield, a very very bad lose. The two units of Leadbelchers which were protecting the flanks both fell in battle to shooting and magic. The Gnoblars fell to the Hyrda and Black Guard. A big mistake was not fleeing with the units of Gnoblars, I decided to stand and shoot instead (bit of a stupid move). Now with my flanks exposed my army was looking very small on the battlefield, which is something that is unusual. I would have had six units remaining in my standard 7th edition build, but with this build all I had remaining was four. The Dark Elves were outnumbering the Ogres by turn 3! I found that even though the Ironguts had more attacks, the Black Guard with their attacks were removing Ogres before they could attack. The low initiative of the Ogres is now a big problem to overcome. Highlights of the battle was the Gorgers removing the unit of Shades, then with standing an onslaught of Elven shooting for two rounds. One final blow for James was when his unit of four Cold One Knights over ran into a forest therefore taking a dangerous terrain test, you guessed it James rolled four one’s! I would like to get another Scraplauncher so will probably drop one of the Leadbelcher units. A Butcher would also be a nice addition, so may be the unit of 3 Bulls could be dropped (but in doing so I need to combine the Gnoblar Fighters into a single 40 model unit!). But in getting another Scraplauncher I need two units of Gnoblar Fighters and therefore two units of Bulls. Bloody stupid Ogre Kingdoms army restrictions, are you reading this Phil “Ogre Kingdoms Author” Kelly. At 2,400 points I will have more options available, but at 2,250 points the army looks a lot smaller than it previously did! Will have to get the Warriors of Chaos on the battlefield for a 8th edition battle soon. The draw for the first two rounds of Summer Incursion has been posted on The Warhammer Forum, and my Ogre Kingdoms have been drawn against Tomb Kings and Beastmen. Both of these armies allow my Ogres to take an additional 250 points. So what to take? I have the option of two units of two Leadbelchers, or a unit of two Leadbelchers and a unit of three Bulls with additional hand Weapons, or a Hunter with Beastkiller, or a Hunter with Seigebreaker. Against Tomb Kings I think my best bet is probably the Hunter with Seigebreaker auto hits and D6 wounds should make a mess of some chariots. I have seen this Tomb Kings army at Gobstyks earlier in the year and it has a bucket load of chariots, so tempted with the Hunter. Also we have the Bullgorger cast on my three units of Ironguts for smashing chariots, should be fun. Could the Butcher with his immune to poison tackle the swarms, may give it a go? Against Beastmen again I am tempted with the Hunter with Seigebreaker or may be the two units of two Leadbelchers. Depends on how many chariots I will be facing. I haven’t played against Tomb Kings or Beastmen with my Ogre Kingdoms yet, so the first two games should be fun. With only fifteen days until the Summer Incursion and I still have a hell of a lot of painting to complete. Both the Scraplauncher and Gorger need gloss and matt varnishing. The Gnoblar Trappers are only partial painted. And the forty Gnoblar Fighters are built and primed along with the movement trays. Plus I want to make some more mushrooms for the extra units to tie them in with the current army. As well as static grass and bits and pieces on the bases there is a lot to do. So I have drawn up a plan. If I stick to it religiously then I may be in with a chance, but its going to be tight. Back to the painting table. I have always taken the Wyrdstone Necklace on my Tyrant. Recently I have been looking into the comparison between the Spangleshard Talisman and the Wyrdstone Necklace. The Wyrdstone Necklace grants a 5+ Ward Save with the minor negative that the Tyrant could take a wound after deployment. The Spangleshard Talisman is a strange on. If wounded by strength 7 or better then you get a 3+ save. A strength 6 attack and its a 4+ save, Strength 5 is a 5+ save. Therefore attacks greater than Strength 5 the Spangleshard Talisman is better than the Wyrdstone Necklace. Here is the snag against strength 4 the save is 6+ and strength 3 no save at all. This leaves the Tyrant at risk against normal infantry, magic missiles and Elven shooting when taking the Spangleshard Talisman over the Wyrdstone Necklace. Also the Spangleshard Talisman cannot be used against automatic wound items, but I don’t see these very often. I am now considered the Spangleshard Talisman on a Hunter, but at 30 points it restricts the magic weapons available to only the Sword of Might. One option I quite like the look of is the Spangleshard Talisman and the Beastkiller big name on a Hunter. This combination could be used against dragons typically giving a 4+ save, also causing multiply wounds. I think I will probably run this combination for the Summer Incursion in a couple of weeks.